Kevin Harvick (Stewart-Haas Racing) wins the Foxwoods Resorts Casino 301 at New Hampshire Motor Speedway at Loudon, the 20th race of the regular season of the Monster Energy NASCAR Cup Series. It’s the sixth win of the season for the driver of the #4 Ford Fusion and his 43rd Cup Series win in a career. 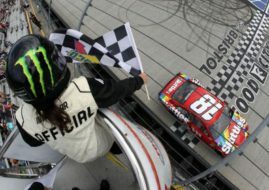 With seven laps to go, Kevin Harvick applied the bump-and-run to Kyle Busch (Joe Gibbs Racing #18 Toyota Camry) to take the lead and after that, he went to win the race with an advantage of 1.877 seconds. He won for the third time at Loudon’s one-mile circuit. Stewart-Hass Racing’s Aric Almirola finished third after leading 42 laps in the #10 Ford. Martin Truex Jr. finished fourth in the #78 Furniture Row Racing Toyota after winning Stage 1 and leading for 83 laps. Chase Elliott completed the top 5. Pole winner Kurt Busch was leading the most (94 laps) before finishing eighth. The next race of the NASCAR Cup Series is the Gander Outdoors 400 at Pocono Raceway on July 29.